The renowned Corning Museum of Glass engaged D.W. Arthur Associates to design two exhibitions of work by one of the founding American glass artists, Frederick Carder. The design project included both a main gallery showcasing a comprehensive cross section of his work, as well as an exhibit fronting the street that is part of the Corning Learning Center adjacent to the corporate headquarters. 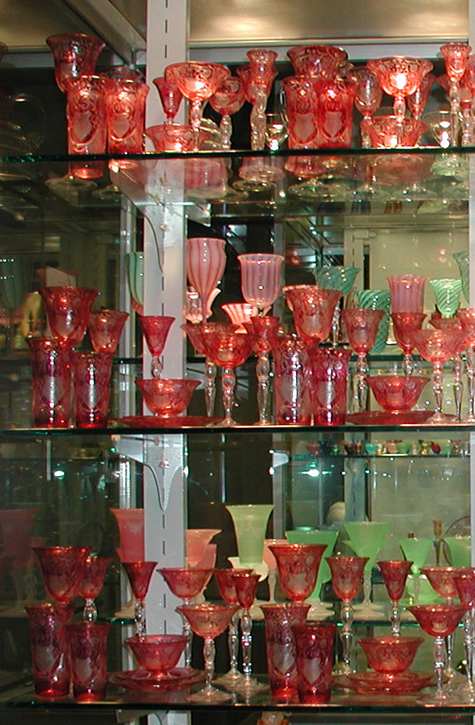 The Carder Gallery, located at the Museum of Glass, is organized by a series of closely spaced transparent display cases, arranged in this manner in order to reinforce the encyclopedic aspect of Carder’s work. Within the display cases the art objects are carefully lit, providing the only illumination in the space. The density of the glowing objects set against a darker background creates for the viewer a dramatic immersion in this collection. The exhibit in town occupies the Market Street windows of the Corning Learning Center, in the center of the historic Gaffer District, and next to the Corning Inc. headquarters. The exhibit presents a sampling of the works, while providing a degree of privacy for on-going proprietary corporate education programs which take place behind the street-front installation. The objects are arranged against an undulating curtain of laminated stippled glass and copper mesh that occludes views to the interior without diminishing daylight. This exhibit constitutes a visual link between the storied history of Steuben and Corning glass, the ongoing legacy of primary research the company conducts nearby, and the education and strategy development that transpires in the meeting rooms behind this glass screen.